One thing one clear before going in the jam. I wanted a game that was focused on the feel. 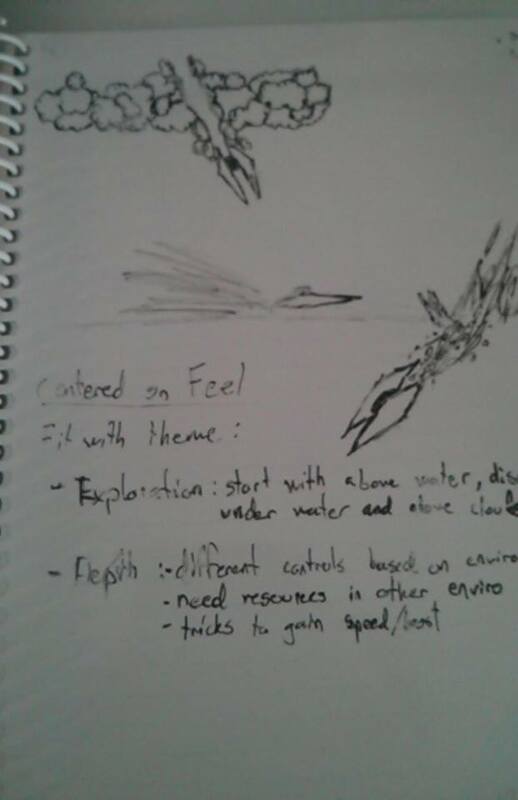 I started to think about a game I wanted to make the day before the jam. I had played dolphin olympics again and it brought a lot of memories of the time I had first played it. Now that I make game, I wanted to make a tribute to it. I started to draw a bit and take some notes about how I could incorporate the feel of dolphin olympics with different themes. I did manage to translate those 3 drawings into my game, Yay ! When I learnt about the theme, I started to think about ways to incorporate it with very few controls. I knew I wanted the feel of dolphin olympics, but there's also some part of it that I didn't want. One thing that I wanted different was the very long jumps. In dolphin olympics, the jumps serves as a break and to create tension for the inevitable landing that you'll have to do. For dual purpose mechanics, it didn't do so much. To change that, I added the heat mechanic. Its purpose is to force the player to switch between the two controls he has, steering and boosting. By incorporing it to the environment by making the sky increases your heat while the water reduces your heat, it forces you to not stay too much in one place. I think the heat worked well. It was simple and it allowed me to take plenty of time to polish the feel. In fact, I didn't start to implement the scoring system and the game loop until a few hours before the end of the jam. (I really recommend not doing this, I usually do it the other way around but I was experimenting this time). Overall I'm really satisfied with the results, I find myself enjoying the game still, which is quite rare for a jam game. The one thing I would have done better is to push the heat system a bit more to explore the dual purpose mechanic a bit further. Oh, and adding sounds too, I feel bad for that. It will get fixed in a post-jam version !